The US Aerospace industry has finally taken off from its runway of 2018 as we have already mentioned in a market review last week. This is the right time for traders and investors to take action and look for the opportunities in a sector that was trading sideways since the beginning of the year and now it is breaking OUT! 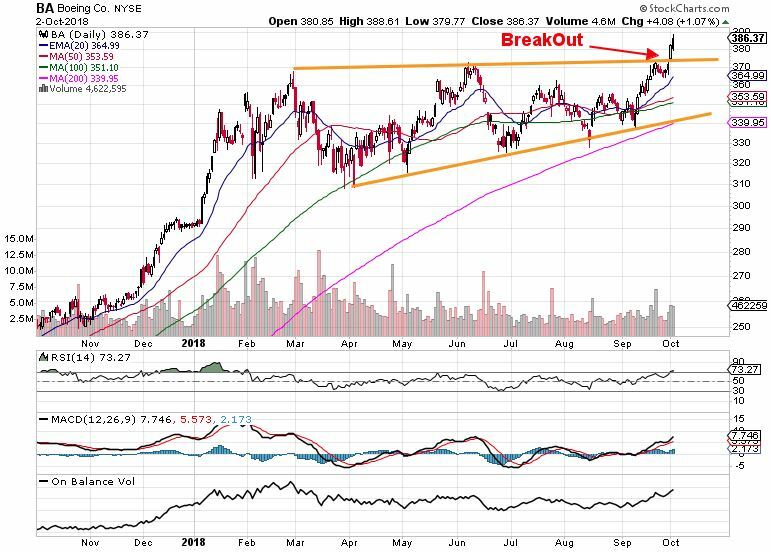 One of the most attractive trading opportunities has just popped up and no wonder it is The Boeing Company (NYSE:BA). Let’s see how to invest and trade Boeing stock! Boeing has recorded a propitious history of earnings during this year, while the share price was moving sideways since the stock is strongly correlated with its industry. Once the industry breaks out, it releases a lot of air and thus, the good quality stocks can lead the rise of the sector. Furthermore, there is a positive consensus forecast of the EPS growth that may drive the stock price in a significant manner. At the moment the price might be at beginning of a climb on a 20 EMA. During the entire year until now, the stock price was consolidating in a formation of Ascending Triangle Pattern. At the beginning of October on Monday Boeing completed this pattern by piercing through the resistance level – upper orange line. This is a time to take a long position since it is very likely the stock is going higher. In 35% of times, the price tends to revert back to the orange line to test its new support level. Swing traders might take the opportunity of such fluctuations. RSI has just entered above 70 territory that signifies almost overbought level. During such breakouts, the overbought may last some time driving the price significantly higher. MACD is line kept above the signal line demonstrating an upward trend. On Balance Volume increased well – the highest since March. The above results signify a very favorable capital management with a good path to increase the shareholders’ value. If you want to trade Boeing, sticking to the above technical analyses is a crucial task. Large-caps as this are working very well with displayed moving averages, trend lines, and other technical indicators. Boeing stock represents a fabulous opportunity for both long-term and short-term investors. So, tighten your seatbelts, it seems like we are about to take off!